We provide a full selection of products to remodel your kitchen and bath, as well as specialty projects. We supply and install a wide variety of cabinets and accessories from three major manufacturers, Hertco, Kraftmaid, Dewils. We offer a complete line of countertops, which includes the beautiful, unique and incomparable Granite. We also provide durable natural quartz countertops such as Technistone, which is a tough synthetic stone product that is stain, heat and scratch-resistant. In addition, we provide top of the line Corian countertops from DuPont, with the option of an integrated sink. View our countertop web page for more countertop solutions. 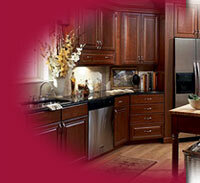 Through an arrangement with Sears, Tool Time also provides our clients with special discounts on major appliances. To view more about our products, please click on one of the links below or visit our Showroom conveniently located near the Pyramid on MiraMar road at 7546 Trade Street.